Established in 1993 as an expansion team of the Major League Baseball, the Florida Marlins, winners of two world series (1997 and 2003), have been renamed the Miami Marlins and will be moving into a fancy new stadium at the start of the 2012 season. 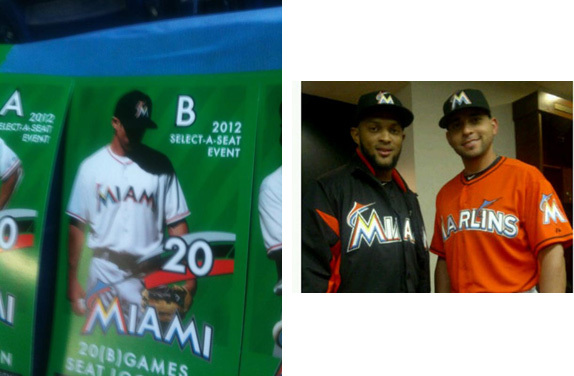 Miami Marlins’ management had a hard time keeping the name, logo, and uniform change under wraps, with the logo being leaked as early as September and, stealing the thunder from a webcast conference unveiling the new look, a picture of the uniforms and a ticket brochure surfaced earlier in the week. This past Friday, the official unveiling took place at their new stadium. Brochure and uniform leaks from last week. Owner Jeffrey Loria introduces the new Miami Marlins. Watch logo animation in the first minute. Aside from some superloosely tracked serif typography, the old logo wasn’t too bad, even if the marlin looked as if it had just been pulled from the sea, perhaps with a too realistic rendering and facial expression. The new one, by contrast, is a tacky, swooshy abstraction of a marlin jumping our of a faux Art Deco letter “M” that lacks the vibrancy of the Miami texture it so desperately is trying to capture. Underneath these two elements is some more typography that fails to capture a specific mood; the “M”s are a good start, but who dropped an anvil on top of the “A”? 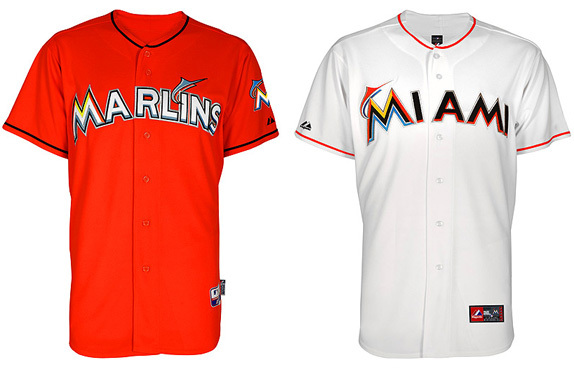 The M+Marlin lock-up is then used to spell out “Miami” on the uniforms and merchandise in a pretty terrible way, completely unbalanced and awkward, further showcasing how bad the wordmark is. 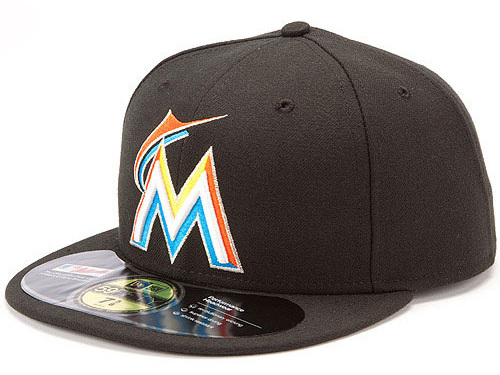 To complete the logo package there is a “Marlins” version with the marlin jumping ship to the “i” amidst more poorly conceived sans serif typography. The only redeeming quality of this whole identity is, perhaps, the orange, which does feel Miami-ey. Oh, and also, it embroiders. Overall, a terrible identity from a city with such a rich visual landscape. Home, alternate, and road uniforms, above. Some merchandise, below. Thanks to Trenton Burd for first tip. Established in 1993 as an expansion team of the Major League Baseball, the Florida Marlins, winners of two world series (1997 and 2003), have been renamed the Miami Marlins and will be moving into a fancy new stadium at the start of the 2012 season. Miami Marlins' management had a hard time keeping the name, logo, and uniform change under wraps, with the logo being leaked as early as September and, stealing the thunder from a webcast conference unveiling the new look, a picture of the uniforms and a ticket brochure surfaced earlier in the week. This past Friday, the official unveiling took place at their new stadium.